After two regular board meetings and four special board meetings, the Santa Ana Unified School District (SAUSD) was unable to fill the vacancy on their School Board that resulted from the election of Ceci Iglesias (R) to the Santa Ana City Council. As such, they did not meet the February 9 deadline under state law to fill the vacancy by appointment, and the County Superintendent of Schools must call a special election for SAUSD. The special election will take place on Tuesday, November 5, 2019, less than one year after the regular election for School Board (and City Council). The regular election for the next term for the same School Board seat will be less than a year later on Tuesday, November 3, 2020. After winning 39.1% of the vote in a three-way race in the November 6, 2018, election, Iglesias was sworn in to the City Council on December 4. Her former School Board seat will be vacant for nearly 11 months, with the special election winner holding the seat for just over a year before the term expires. On December 11, the School Board voted to hold an appointment process. Applications were due January 3. The School Board held a special meeting on January 8 to interview the 10 applicants. During that meeting, 2 applicants were ruled ineligible because they did not live in the School District boundaries, and 3 finalists were picked from the 8 eligible applicants. At a January 15 special meeting, the Board deadlocked 2-2 on the appointee for the vacancy, with Board Members Rigo Rodriguez (D) and Alfonso Alvarez (D) voting to appoint Carolyn Torres (D) and Board Members John Palacio (D) and Valerie Amezcua (D) voting to appoint Bruce Bauer (D). A compromise attempt by Palacio to appoint the third finalist, Sergio Verino (D), failed when no one else supported Verino. At its January 22 regular meeting, the Board deadlocked 2-2 on Torres and Bauer again. At its January 29 special meeting, the Board deadlocked 2-2 on Torres and Bauer a third time. At its February 8 special meeting, the Board deadlocked 2-2 on Torres and Bauer a fourth and final time. Torres and Verino both received four votes to advance to the finalist stage while Bauer received three votes (Rigo Rodriguez dissenting on Bauer). Valerie Amezcua proposed advancing Barban to the finalist stage, John Palacio proposed advancing Macias, and Rigo Rodriguez proposed advancing McLoughlin. Alfonso Alvarez provided a second vote for each of the three to advance to the finalist stage. Only Rigo Rodriguez supported advancing Montoya to the finalist stage. These results would not be surprising if it weren’t for the fact that Charles Munger Jr. spent almost $500,000 on Daigle’s behalf to try to get her to the November run-off. Even Bob Rush, who was a Dem sacrificial lamb in this race, spent almost $100,000. These numbers are stunning in that this much was spent trying to beat an incumbent and not for an open seat. Generally, candidates will spend more money trying to win an open seat as opposed to trying to unseat an incumbent (since incumbency is so tough to overcome). I’m going to be very honest: Onofre only raised $3,250 in her race for Santa Ana City Council, and this was for an open seat! AD-74 already has a field of strong candidates with the ability to raise money. 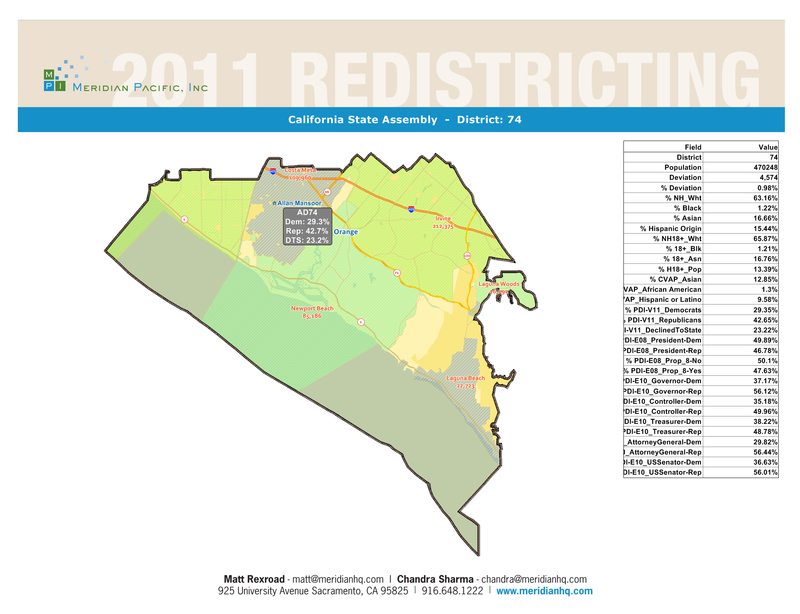 Onofre has no name identification in AD-74, has no fundraising base, and will face allegations of being a carpetbagger. Huntington Beach Councilman Matt Harper, AD-72 staffer Emanuel Patrascu, and former CRP Treasurer Keith Carlson have already expressed an interest in this race. Harper is the early front-runner in this race since Huntington Beach is the second-most populated city in AD-74 (Irvine is the most populated, but no current candidate is based out of Irvine). Patrascu is not very well-known in AD-74 and hails from Laguna Beach (only about 6% of the population in AD-74), but he does work for Travis Allen and might get some decent help from his boss, who would want to get an ally elected to the Assembly. Carlson will likely have a ton of establishment support and will be able to raise quite a bit of money through his connections as former CRP Treasurer. I’m going to go out on a limb and say that the real wildcard here is Orange County Supervisor John Moorlach. He is set to announce his candidacy for the 45th Congressional District at some point very soon. If for whatever reason, Moorlach decides that CD-45 is not the right fit (I actually think that he can win), he could easily destroy anyone in the field in AD-74 (assuming he doesn’t just clear the field outright) and walk into the Assembly.